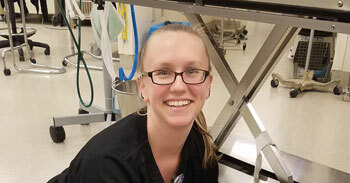 Veterinarian led and owned for three decades, everyone at MedVet strives daily to enhance the lives of pets, their loving families, and the veterinary community. Through this relentless commitment and dedication, MedVet is growing a network of emergency and specialty hospitals for pets, with facilities across the Midwest, Gulf Coast, Texas, and Mountain regions to deliver exceptional care and preserve the integrity of the profession. 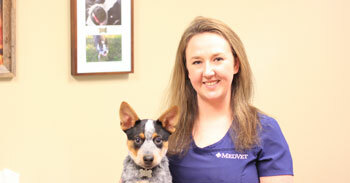 Our team consists of nearly 2000 team members helping to advance our mission of Leading Specialty Healthcare for Pets. Through this effort, we have been able to help and serve nearly 200,000 pets and their families, and more than 5,400 Referral Partners each year. We have a culture built on three core values: Teamwork, Leadership, and Compassion. These values are behind everything we do. They also guide us as we execute our mission. From the operating room to the office to the front desk, you’re part of a special team that’s the best and brightest in your field. Just like our patients and clients are counting on MedVet, we’re counting on you and your coworkers to come together, as a team, and deliver exceptional care to our patients, their families, and referring veterinarians. This means lending a hand when needed, working extra hours at times, and working collaboratively with others. MedVet leads our industry in providing medical excellence through patient care, medical technology, and clinical studies. We’re constantly leading by identifying problems and stepping forward with solutions. You are the eyes and ears in the areas you work and can often see a solution before others. We’re counting on you to help discover better practices and more efficient ways to work. Everyone is a leader at MedVet. Compassion must be at the core of everything we do at MedVet as we care for our patients and our clients’ and Referral Partners’ needs. Our clients can often come to us concerned, worried or distraught, and a warm smile or a sympathetic nod can make a big difference. Our Referral Partners are entrusting us with the care of their patients and share in our desire to deliver the best possible outcomes. Compassion for our coworkers is key, too. 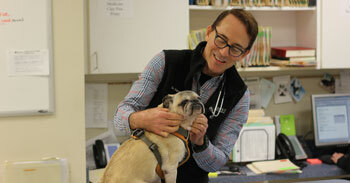 Treating others with kindness is simply the MedVet way. "I feel like from day one, everyone has been super nice. It's like a big family. I went from having a job where I had limited interactions to others, to being here where everyone cares about what's going on with you. The managers come by and check in and ask if we need anything. Everyone is so welcoming and everyone has the same goals to help our patients, clients and team." 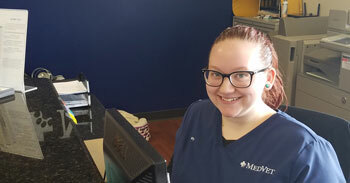 As a MedVet employee, you are empowered to go above and beyond to deliver an unrivaled experience for everyone you meet. We’ll be counting on your passion, your voice, your growth, your wellbeing, and your leadership to help us fulfill our mission of Leading Specialty Healthcare for Pets. Each of us care deeply about something. Whether it’s family, doing our best, helping others, or love of pets, passion is what fuels our energy and gives meaning to the work we do. MedVet people are passionate people and that makes the Employee Experience special. We encourage you to share feedback about your Employee Experience. Whether it’s an idea on how to make a process more efficient or letting a manager know about what a great job one of your fellow team members did, your voice can make a difference. We’re listening. If your goal is to be the leading expert in your field, manage a team, or provide patient care better than anyone else in your hospital, you have come to the right place. At MedVet, we want to grow our hospitals and organization, so we can serve even more pets — and also so we can continue to invest in our facilities, equipment, and people. MedVet is growing, which creates opportunities for you to grow as well. Taking care of our patients and clients requires a lot of energy both physically and emotionally. That’s why taking the time to focus on our own wellbeing is an important part of the Employee Experience. Many of the benefits MedVet offers are designed to help you be healthy and happy: emotionally, physically, and financially. Every employee at MedVet is a leader. As leaders, we own our work and partner together to solve problems. It’s your leadership that puts a smile on our clients’ faces, helps get our patients through some tough times, and maintain our position as a leader in the profession. Medical, Dental, and Vision insurance available, with premium costs shared between you and MedVet. 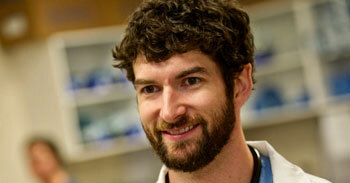 Continuing education opportunities such as hands-on labs, lectures, and more. Pay for certain qualified expenses on a pre-tax basis with Healthcare, Flexible and Dependent Spending Accounts. Employer-paid group term life insurance and long-term disability. Benefits such as pet insurance, pet bereavement, and discounts on pet care to help take care of your furry or feathered friends. A grant of hours to be used for vacation, holiday, and sick leave to support work-life harmony. An annual allowance for apparel items such as lab coats, jackets, and scrubs to help you look your best while delivering care.